Jaxson Trichak and Kuhio Carl Rewrite Kent Valley’s 10U Record Book – Check it Out! Kent Valley Ice Centre, Kent, WA., Thursday, November 1, 2018 - Jaxson Trichak and Kuhio Carl of the Kent Valley 10U Tornadoes have rewritten our 10U Record Book with their scoring efforts in the first three games of the 2018-2019 hockey season. Trichak and Carl have all but eliminated Edward Sun, previous record holder, from the 10U Record Book. Congratulations to Jaxson Trichak and Kuhio Carl for their impressive accomplishments. The KVHA Record Books can be viewed by clicking here. 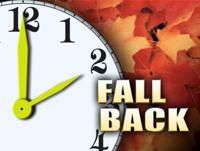 It's time to turn your clocks back. Daylight Saving Time ends Sunday, Nov. 3 - meaning when the clock strikes 2 a.m., we'll be "falling back" an hour to 1 a.m. For morning people, that means there will be an extra hour of sunlight in the morning. However, that also means your evening commute may be in the dark. Kent Valley Ice Centre, Kent, WA. October 27, 2018 – Kent Valley’s 12U Tornadoes were shutout 2 to 0 Saturday by the Seattle Jr 12U Badgers. The game was played scoreless through the first two periods and much of the third. The Badgers scored two goals in less than two minutes to earn the win. The Badgers out shot the Tornadoes 20 to 2. Nicholas Frair stopped 18 of 20 shots on goal for a save rate of 90%. Bremerton Ice Arena, Bremerton, WA. October 27, 2018 – Kent Valley’s Jake Ferguson opened the scoring in the first period for his Vipers with a goal at 8:30. Ferguson was assisted by Blake Sloan and Michael Poliakov. West Sound tied the game at 1-all early in the second period. Kent Valley regained the lead two minutes later with an unassisted goal by Michael Poliakov. West Sound pressured the Vipers less than two minutes later and tied the game for a second time. Kent Valley’s Owen Smith scored the winning goal with 7:33 remaining in the second period. Smith’s goal was assisted by Simon Barei. The two teams played scoreless in the third period with Kent Valley claiming a 3 to 2 victory at the final buzzer. Kent Valley outshot West Sound 24 to 17. Ben Glidden earned the victory in net for the Vipers by turning away 15 of 17 shots for a save rate of 88.2%. Way to go Vipers! Kent Valley Ice Centre, Kent, WA. October 27, 2018 – The Kent Valley 18U Tornadoes churned up category-5 winds Saturday as they powered over the West Sound 18U Warriors Red 6 to 3. The Tornadoes scored 3 unanswered goals in the first period to take a commanding lead over Red. Steven Rosenquist completed his Hat Trick in the second period while West Sound got two of their own to end the period 5 to 2 in favor of the Tornadoes. Both teams scored goals in the third period and the game ended at 6 to 3 in favor of the Tornadoes. The Tornadoes outshot the Warriors 26 to 20. CJ Hundal stopped 17 of 20 shots for the Tornadoes and earned a save rate of 85%.